I don’t know about you, but I think mince pies are so over-rated. Controversial I know, but there’s something about mincemeat that sets my teeth on edge. I’m ok with it if it is a tiny amount or it is drowned in custard, but otherwise I’m not a fan. But everyone has mince pies with a drink at Christmas, so what do you have if you don’t like them? With the help of the wonderful BODDINGTON’S BERRIES you can enjoy a lovely sweet custard tart with a fruity festive flavour, and it is so easy to make! 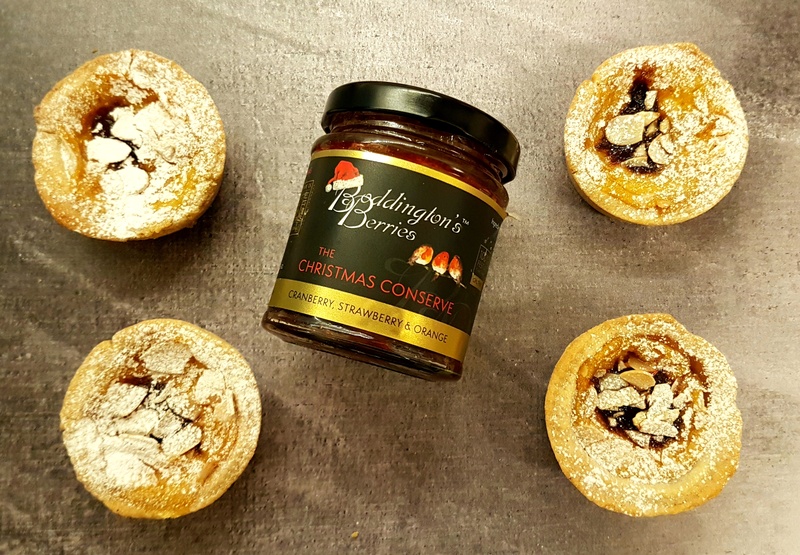 This year they have brought out 2 special Christmas products: a beautiful Christmas Chutney which I talk about in THIS POST and a deliciously indulgent Christmas Conserve. Both of these products are absolutely heavenly, and this Christmas Conserve really has the Wow factor! Boddington’s Berries kindly sent me a jar to try in some recipes, and my first thought was how good it would be in these little tarts. 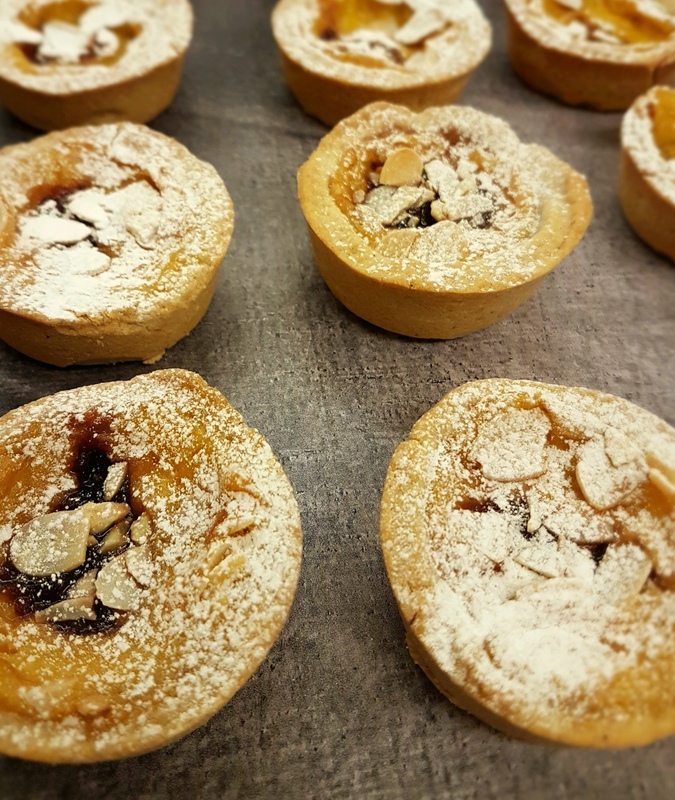 I have made these tarts before using mincemeat, and until now that was my alternative to mince pies. That has changed now as the updated version with this conserve is much much more delicious! Before I give you the recipe, let me tell you about the Christmas Conserve, as this… is… amazing! I love that serving suggestion. I can imagine sitting in front of a fire doing exactly that. That would be a perfect Christmas Day breakfast too! This Conserve is jam-packed with fruit (no pun intended) and the combination used is absolutely perfect. The addition of the cinnamon and cloves means it really is Christmas in a jar. I have ordered more of this so we can enjoy a Christmas cream tea on Christmas Eve when all the preparations are done and we can finally relax. I am really looking forward to that! This Conserve on freshly baked scones with a dollop of clotted cream will be divine!!! (If you fancy the sound of that too, order a jar today to make sure you have it in time for Christmas, and THIS RECIPE is the best one I have ever tried for scones. Trust me, you will LOVE this conserve on scones). Back to my recipe. 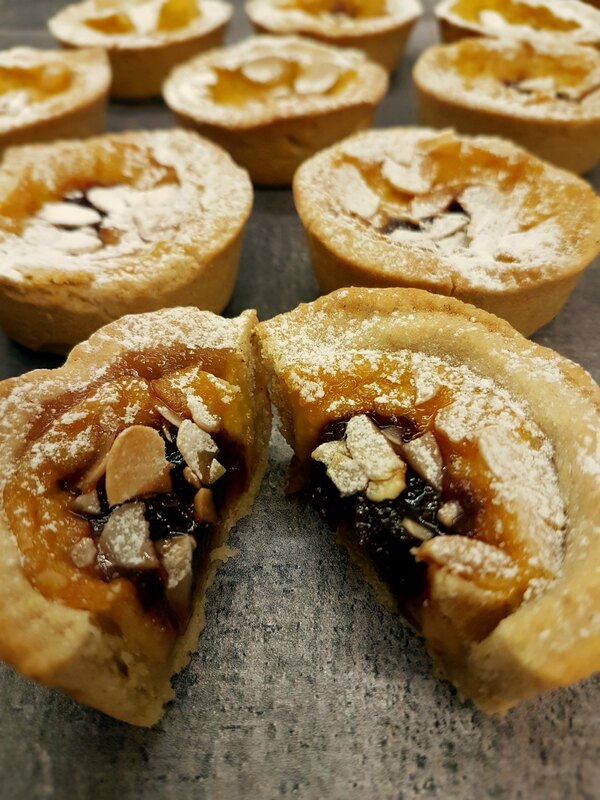 These tarts are made with a beautiful sweet cinnamon pastry which complements the conserve well. You can make your own custard for the tarts if you prefer but they work so well with ready-made custard, so I just use that. Christmas bakes for me are all about great taste with minimal fuss as there is always soooooo much to do, so the occasional cheat is allowed 😉 As this Christmas Conserve is such high quality and high in fruit, it doesn’t bubble up and overflow like normal jam often does in tarts. This means you can use more of it in these as it stays perfectly where you place it. Sieve the flour into a bowl and then use your fingertips to rub the butter in to it, until it resembles bread crumbs. Add the sugar and cinnamon and mix it all together. Add the beaten egg and, using a round ended knife, mix the egg in to the flour mixture as best as you can. Use your hand to press any dry bits in to the pastry mixture. Press it all together until it becomes a nice smooth ball. It will feel a bit sticky but that is perfect. Wrap it in clingfilm or foil and place in the fridge for 30 minutes. While the pastry is chilling, preheat the oven to 200C/180C fan. Lightly grease a 12 hole muffin pan. When the pastry has chilled, gently press it together until it is soft enough to roll out. Dust your worktop with flour and roll out your pastry to about 4 mm thickness. Use a large round cutter to cut out circles. Press the pastry circles in to the muffin pan cavities. The pastry sides should go at least halfway up the pan. (If you have cut your pastry thick enough you can gently press the sides to make the pastry go higher up the sides if needed). Add 1 heaped teaspoon of almond custard to each pastry case, and then add a teaspoon of Christmas Conserve on the middle of the custard. (If you have pressed your pastry cases high up the sides of the pan you can add a bit more of each filling). Sprinkle a few toasted flaked almonds over the top. Bake in the centre of the oven for around 15-20 minutes, or until the pastry is golden. Leave to cool in the pan for 5 minutes, then gently remove them using a small spatula or knife to ease them out. Dust with icing sugar. Serve warm or cold. Depending on how high you made your pastry cases, you will probably have enough pastry and filling to make 4-6 more tarts. The custard puffs up while the tarts are baking but don’t worry, it does deflate a bit when they are ready. I hope you like these as much as we all do in my house! 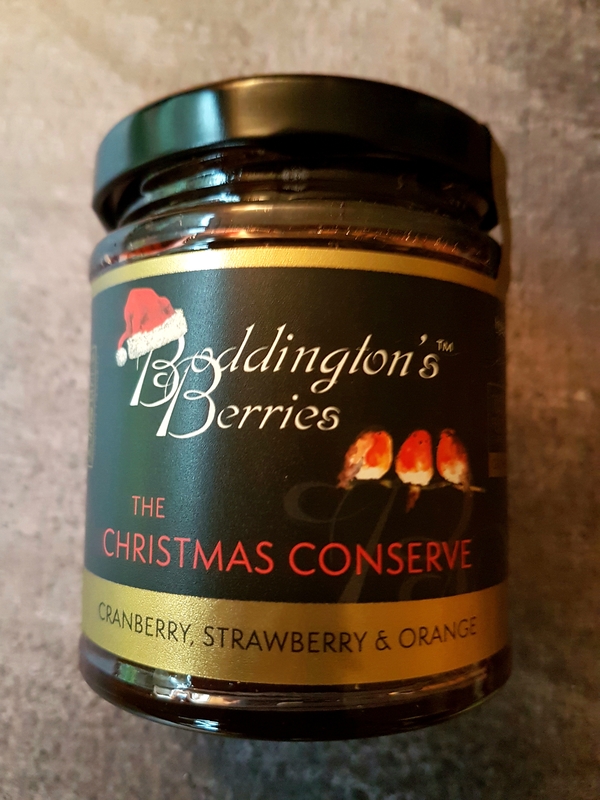 To buy this delicious Christmas Conserve, CLICK HERE to go to directly to the product on the Boddington’s Berries website. Delivery is free so grab some quick in time for Christmas! Happy Baking!